I would always ask my college and graduate students in Anthropology, aside from learning anthropological concepts and theories inside the classroom, to explore places, experience cultural or social happenings, and write ethnographic accounts using the participation-observation method. I am posting in my blog with the writer's consent selected ethnography penned creatively by my students to contribute to the emerging sub-discipline of anthropology called 'Virtual Ethnography'. Basically, virtual ethnography is also referred to as Webnography. We cannot deny the fact that with increasing use of technology and the Internet, there is now a demand for online spaces on various ethnography. Things aren’t always what they seem, especially when you are the one from the outside looking in. It’s a classic case of expectation vs. reality. When I was on my way to Avilon Zoo, I already had something in mind. I arrived at around 10:00am and I had already accepted that I would see a large group of kids and parents. I expected to hear a mix between children’s excited laughter and animal sounds. But to my surprise, I saw and heard neither. When my friend and I went there on a perfectly sunny Saturday morning, it was as if we were the only visitors. More people eventually arrived but unless you were part of a tour group, you would only occasionally bump into other groups of people in the zoo. Most of the time, it was just me, my friend and the animals in a 7.5 hectare facility housing more than 3,000 specimens of wildlife. A sign saying “We are a wildlife conservatory” was the first thing that caught my eye as we started to walk around. Apart from housing exotic animals, this zoo promotes conservation through captive breeding. In this process, endangered species are captured from their natural habitat and bred in a controlled environment to ensure their survival. Mr. Jake Gaw and his wife came up with the idea of transforming this hobby and weekend place into a zoo way back in 1995. The couple thought it would be nice to “offer guided tours and educational field trips for guests/visitors. To have the privilege to observe and discover about the ecology and behavior of animals.” Furthermore, they wanted people to “learn how to conserve and protect endangered species and save our environment”. I saw their effort to carry out this vision during my visit to the zoo as I overheard the tour guides educate groups of visitors about the animals there and as I read the huge tarps they put up, providing a lot of crucial information about the animals such as their reproductive behavior, conservation status, origin and evolution, morphology, size, distribution etc. They had a very rich selection of exotic species; some cannot be seen in other Zoos we have in the Philippines. I wanted to maximize my experience with the animals so I happily obliged to a paid photo-op with a python and three birds. I got the chance to hold them and interact with them even if it cost me 50 pesos per pictorial. I also saw how Arapaimas were fed chicken heads by paying patrons. Another group of people paid to be able to take a picture with Trixie, the Orangutan, who would sit beside you, smile and pose for the camera. At one point, while no one was watching, my friend dared me to poke a sleeping leopard while it rested near the edge of its cage. And I DID! Good thing it didn’t wake up! After two hours of walking around, we finally reached the Primates Display Area. It was fascinating! I saw species that I never saw before and my favorite among those were Black-tufted Marmosets. They look at you and rotated their heads like crazy as if trying to see you better. Other primates that I saw were The Red Slender Lorises, Capuchin Monkeys, Philippine Macaques, Southern Pig-Tailed Macaques, Crested Macaques, Cotton top Tamarins, Red handed Tamarins (another favorite of mine), various species of Orangutans and Gibbons and so much more! In the midst of my amazement and wonder at these creatures, I felt a tinge of sadness about their condition. The smaller primates were enclosed in glass and stone walls that allowed onlookers to view them. I imagined how small these enclosures felt to these animals compared to an entire forest where they once resided. When I moved over to where the Orangutans and Gibbons were housed, at first I was amazed at the large concrete structures that were built only for them! A small island that resembled a network of branches surrounded by a moat was their tiny jungle paradise where in they were supposedly “free range”. But my fascination turned into pity when I noticed something that caught my eye. I saw that the base of these islands were surrounded by wires and when I saw a sign that read “DANGER. 10,000 volts”, everything made sense. Apparently, these were high voltage cables that kept these primates from escaping their mini jungle and roaming freely about the entire zoo. This sight made me ask myself, “As much as zoos are fascinating places to visit, do they really help in making us fully understand how animals behave? Is this the best way to get to know these animals?” For one thing, it is not their natural environment. Some animals become dependent on the zookeepers instead of employing their instincts to hunt and catch food. Because of this, there is a great possibility for their offspring to lose their natural instinct if they are continually bred in this simulated environment. These zoos may be the most convenient and accessible way for us to observe these animals but I prefer how Jane Goodall did it. She actually went to the animals’ natural habitat, stayed and lived with them. She saw firsthand how fascinating these creatures really were. In my honest opinion, I feel that the primates aren't just merely forms of entertainment but intelligent beings who truly belong in the wild. Looking back, I realized that these types of living conditions had a negative effect for the other animals as well. One example was the Luzon Warty Pig who, according to the tour guide, contained more fat than muscle when in captivity as compared to those in the wild. Another example were the Capybaras who was said to grow much larger in the wild compared to being in captivity. It then hit me that when purpose is distorted, the breakdown of natural order follows suit. 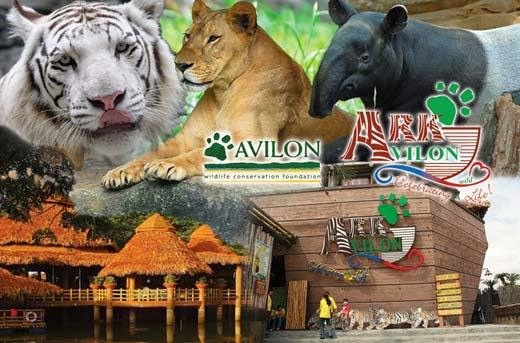 The aim of Avilon Zoo is to conserve and care for these exotic animals to protect them from potential threats---may they be poachers, predators or food scarcity. But therein lies the crux of the problem. Secured in this spacious land, animals can both be seen as bound and free; they are in a paradox of simultaneously being restricted and unrestricted. The blame doesn’t fall squarely on the shoulders of the zoo owners as they simply wanted to make these majestic creatures both available and accessible. However, the experiences that people have in zoos are a far cry from what one encounters in the wild. It made me think that the more animals are restricted, the more stifled the experience people have with them. My exposure to these animals in such an environment led me to think more deeply about their situation even if my time with them was limited. I firmly believe that if given the chance, observing these animals in their natural habitat would be more rewarding and more importantly, more genuine. Granted that not too many people have such a privilege, alternatives such as documentaries can take people on journeys to where these animals live and could offer a much more accurate picture of how they interact with each other. Of course, this is easier said than done but the right choice was never easy to begin with.